The recent attacks in London, Tehran, Melbourne, Paris, and elsewhere have focused attention on the fight against ISIS inside Iraq and Syria. Coalition forces announced the long-awaited offensive for Raqqa and are fighting to liberate Mosul. The renewed focus on ISIS distracts from the greater emerging long-term threat posed by al Qaeda. Al Qaeda is pursuing a global strategy of enmeshing its forces in local movements and militias. In Yemen, al Qaeda in the Arabian Peninsula (AQAP) seeks to strengthen and build its support base through a focus on the local fight. AQAP’s expansion of a popular base and its safe havens threatens U.S. national security. U.S. Director of National Intelligence Daniel Coats testified in May 2017 that AQAP has “preserved the resources, manpower, safe haven, local influence, and operational capabilities to continue to pose a threat.” AQAP leadership statements continue to list the United States and its allies as targets, indicating the group still sees itself as waging a war against the West. The group supports external efforts to conduct small-scale attacks. AQAP emir Qasim al Raymi encouraged supporters in the West to rise up as part of a global Muslim army in a late May 2017 statement. Additionally, U.S. intelligence officials reported that AQAP transferred the capability to conceal explosives in electronic devices to al Qaeda affiliates in Somalia and Syria. 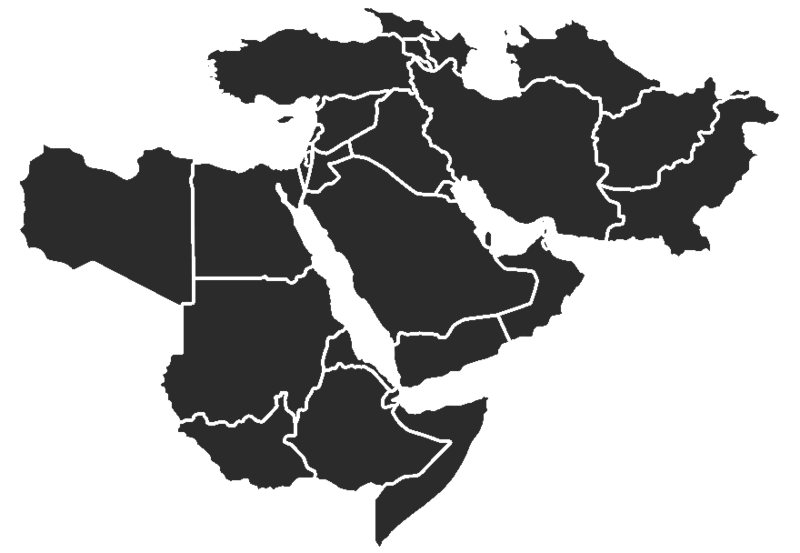 AQAP’s current focus on its local operations is intended to expand its base in order to support future external attacks. The Yemeni civil war created conditions that enabled AQAP to expand. The Iranian-backed al Houthi movement and loyalists of former Yemeni president Ali Abdullah Saleh seized control of much of the country in late 2014 and in early 2015, ousting the internationally recognized government of Abdu Rabbu Mansour Hadi. A Saudi-led coalition intervened in late March 2015 to restore Hadi’s government to power. Counterterrorism operations against AQAP slowed and governance began to break down in Yemen’s south as the Saudi-led coalition and Hadi government prioritized the civil war. AQAP took advantage of the focus on the fight against the al Houthi-Saleh bloc and seized control of Yemen’s third-largest port city for over a year. An Emirati-led operation compelled AQAP militants to withdraw from the port city and the territory it controlled. The protracted civil war and absence of a national political resolution to the conflict fuels the conditions that allow AQAP to reemerge, however. AQAP fights alongside and supports local militias against the al Houthi-Saleh faction in order to insinuate itself into local populations. Local tribes and militia forces reject the al Houthi-Saleh bloc and seek to prevent a northern government from controlling their territory. AQAP is active alongside these groups on the frontlines in Taiz and al Bayda governorates. AQAP is participating in a Hadi government offensive that began May 2017 to seize eastern Taiz city from the al Houthi-Saleh bloc. AQAP concentrates its resources on al Bayda governorate, critical terrain for AQAP since at least 2012. There it helps tribal militias seize territory from al Houthi-Saleh forces. The U.S. Department of Treasury listed the governor of al Bayda, Nayif Salih Salim al Qaysi, as a specially designated global terrorist in 2016 for facilitating the expansion and settlement of AQAP in al Bayda. The provision of support to the local militias creates a relationship that has permitted AQAP to operate in new areas, like Taiz, and to deepen its presence in others areas of central Yemen. The increasingly sectarian nature of the war drives support toward AQAP and strengthens the group’s narrative that it is the defender of the Sunni in Yemen. The conflict is largely about local power struggles, and most Yemenis are not fighting for sectarian causes. The Zaydi Shi’a al Houthis, Hadi allied forces, and AQAP have cast it in sectarian terms, however. Regional sectarian tensions and the Saudi-Iranian regional war exacerbate AQAP’s narrative of the Yemeni conflict. Al Houthi policies specifically targeting Sunni Islamist leaders have driven some of the more moderate voices from Yemen and helped mobilize a Salafi population. AQAP’s support for certain anti-al Houthi-Saleh factions, such as those in al Bayda and Taiz, builds on the war’s growing sectarian nature. The group provides shadow governance and basic services to populations behind the war’s frontline, which also build its popular support. AQAP is likely operating some public institutions in Taiz city in areas it helped seize from al Houthi-Saleh forces. Some residents reported that AQAP is the de facto ruler in these neighborhoods. AQAP attempted to provide public services – including security, water, electricity, and dispute resolution – that exceed what the internationally-recognized Hadi government provides when AQAP controlled territory in 2011 and 2015. Some residents of al Mukalla city, which AQAP governed through proxies from April 2015 to April 2016, claim to prefer life under AQAP over the daily corruption experienced under the Hadi government. The Hadi government’s inability to provide services or pay salaries increases AQAP’s recruiting pool and public support. AQAP is conducting a campaign to prevent security forces from establishing control that would limit its freedom of movement. AQAP primarily conducts two types of attacks in southern Yemen: overt attacks on Emirati-backed security forces and covert assassinations of public officials. A high rate of AQAP attacks drove Emirati-backed security forces out of northern Abyan governorate in southern Yemen in early 2017, allowing AQAP more freedom of movement between its support zones in al Bayda and Abyan. AQAP is currently conducting a similar campaign in Daw’an district, eastern Hadramawt governorate. AQAP is likely responsible for a series of assassinations of public officials and tribal resistance leaders in southern Yemen, similar to a 2012-2013 campaign against tribal leaders who helped oust the group from its held territory. AQAP conducts these assassinations covertly in order to preserve its tribal relations and mitigate public backlash. AQAP portrays its actions as in the interest of the local population and operates through customary practices in order to limit the alienation of the tribes. AQAP carefully selects targets and plans attacks in order to decrease civilian casualties so its operations are tolerable to the local population. The group’s careful target selection also differentiates it from ISIS in Yemen, a fact that AQAP emphasizes in its criticisms of the group. It benefits from this distinction by being able to pose as the “moderate” Salafi-jihadi group that is more helpful and less dangerous to the local population. AQAP also attempts to mitigate the threat posed by U.S. and Emirati counterterrorism operations to maintain its tribal support. AQAP claimed it withdrew from al Mukalla in April 2016 in order to protect the local population from a bloody and costly fight. AQAP also negotiated terms to protect tribes from counterterrorism operations by forgoing external attacks to retain its freedom of movement. American and Emirati counterterrorism tactics may create a backlash within certain Yemeni populations. Tribes view U.S. counterterrorism operations as overly costly for their communities and frequently express frustration for the lack of support they receive to combat AQAP. The Saudi-led coalition missed the opportunity to support a wave of anti-AQAP tribal mobilization in eastern Yemen in March 2017. U.S. operations have fostered anti-American sentiments in areas where tribal members are killed. U.S. counterterrorism operations also inadvertently tilt momentum in favor of al Houthi-Saleh forces in places like al Bayda governorate where AQAP is the main force supporting the anti-al Houthi fight. Civilians frequently protest against Emirati-backed security forces arbitrarily detaining, torturing, and disappearing young men accused of terrorism. AQAP then frames its attacks on Emirati-backed forces as reprisals for these human rights violations in order to galvanize support for its cause. A military campaign against AQAP will not defeat the group. AQAP’s source of strength is not its control of terrain or its ability to conduct attacks, the target of ongoing counterterrorism operations. Rather, AQAP draws strength from its sustained relationship with the local population and remains focused on protecting this relationship. AQAP has sustained military defeats in order to retain popular support on multiple occasions, such as its withdrawals from Abyan in 2012 and al Mukalla in 2016. The uptick in U.S. military action against AQAP in 2017 may have degraded AQAP’s ability to operate in the short term, but the protraction of the civil war preserves the conditions for it to reconstitute. The U.S. must orient on changing the conditions set by the civil war that AQAP exploits in order to put the group on course to permanent defeat. AQAP will expand its support zones as long as the Yemeni civil war persists. The U.S. must take the lead in shaping the Saudi-led coalition’s policy in order to reach a political settlement to the civil war and focus the coalition on countering AQAP. A lasting political settlement will enable Yemeni actors to concentrate on providing governance and combating AQAP. A political solution to the civil war will also limit the need for the Hadi government and Saudi-led coalition to depend upon AQAP-affiliated militias, to which they currently turn a blind eye. An inclusive political resolution will advance U.S. national security objectives in the region by removing some of the conditions that AQAP exploits in order to expand its support zones and safe havens. Daniel R. Coats, “Worldwide Threat Assessment of the US Intelligence Community,” Director of National Intelligence, May 11, 2017, https://www.dni.gov/files/documents/Newsroom/Testimonies/SSCI%20Unclassified%20SFR%20-%20Final.pdf. “AQAP ‘Inspire Guide” Analyses London Attack, Offers Advice to Lone Wolves,” SITE, April 7, 2017, available by subscription at ent.siteintelgroup.com. Mike Levine, “Khorasan Terror Group Linked to Summer Airline Plot,” ABC News, September 23, 2014, http://abcnews.go.com/blogs/headlines/2014/09/khorasan-terror-group-linked-to-summer-airline-plot/; Barbara Starr and Rene Marsh, “AQAP trying to hide explosives in laptop batteries, official says,” CNN, March 22, 2017, http://www.cnn.com/2017/03/21/politics/electronics-ban-devices-explosives-intelligence/; and Robyn Kriel and Susanna Capelouto, “Al-Shabaab claims responsibility for Somalia in-fight jet blast,” CNN, February 13, 2016, http://www.cnn.com/2016/02/13/africa/somalia-plane-bomb-al-shabaab/. Katherine Zimmerman, “AQAP: A Resurgent Threat,” CTC, September 11, 2015, https://www.ctc.usma.edu/posts/aqap-a-resurgent-threat. Gulf of Aden Security Review, AEI’s Critical Threats Project, June 7, 2017, https://www.criticalthreats.org/briefs/gulf-of-aden-security-review/gulf-of-aden-security-review-june-7-2017. “Counter Terrorism Designations and Removals,” U.S. Department of the Treasury, May 19, 2016, https://www.treasury.gov/resource-center/sanctions/OFAC-Enforcement/Pages/20160519.aspx; and “Treasury Designates Al-Qaida, Al-Nusrah Front, AQAP, And Isil Fundraisers And Facilitators,” U.S. Department of the Treasury, May 19, 2016, https://www.treasury.gov/press-center/press-releases/Pages/jl0462.aspx. Farea Al-Muslimi, “How Sunni-Shia Sectarianism is Poisoning Yemen,” Carnegie Middle East Center, December 29, 2015, http://carnegie-mec.org/diwan/62375. Yemen Crisis Situation Report, AEI’s Critical Threats Project, April 28, 2017, https://www.criticalthreats.org/briefs/yemen-situation-report/2017-yemen-crisis-situation-report-april-28. “’We Have to obey them’: Al-Qaeda increases its power in Yemen’s Taiz city,” Middle East Eye, March 29, 2017, http://www.middleeasteye.net/news/yemen-war-al-qaeda-trying-take-control-taiz-city-730077656. “Yemen’s al-Qaeda: Expanding the Base,” Crisis Group, February 2, 2017, https://www.crisisgroup.org/middle-east-north-africa/gulf-and-arabian-peninsula/yemen/174-yemen-s-al-qaeda-expanding-base. “Soldiers of the security belt in the central areas ... neglect and suffering,” Aden Tomorrow, April 22, 2017, http://adengd.net/news/255511/; and “Zubaidi appeals to the coalition to provide direct support to the authority of Aden to address electricity and attacks the forces of corruption,” al Masdar Online, April 23, 2017, http://almasdaronline.com/article/90639. Yemen Crisis Situation Report, AEI’s Critical Threats Project, February 8, 2017, https://www.criticalthreats.org/briefs/yemen-situation-report/2017-yemen-crisis-situation-report-february-8-2017. Gulf of Aden Security Review, AEI’s Critical Threats Project, June 12, 2017, https://www.criticalthreats.org/briefs/gulf-of-aden-security-review/gulf-of-aden-security-review-june-12-2017. Michael Horton, “Fighting the Long War: The Evolution of Al-Qa’ida in the Arabian Peninsula,” CTC, January 23, 2017, https://www.ctc.usma.edu/posts/fighting-the-long-war-the-evolution-of-al-qaida-in-the-arabian-peninsula. “AQAP Official Condemns IS’ Bombing of Mosques,” SITE, October 2, 2015, available by subscription at ent.siteintelgroup.com. Thomas Joscelyn, “AQAP says it withdrew from Mukalla to protect residents,” Long War Journal, May 1, 2016, http://www.longwarjournal.org/archives/2016/05/aqap-says-it-withdrew-from-mukalla-to-protect-residents.php. Erlend Ofte Arntsen, “Yemen's al-Qaida: Entered agreement with tribal leaders not to attack the West,” VG, April 16, 2017, http://www.vg.no/nyheter/utenriks/krim/yemen-s-al-qaida-entered-agreement-with-tribal-leaders-not-to-attack-the-west/a/23974002/. “The sheikhs of Mawdiyah Abyan comment on the American strikes with an important statement,” Aden Lang, April 1, 2017, http://adnlng.com/news/65737/; and Iona Craig, “Villagers Say Yemeni Child was Shot as he Tried to Flee Navy SEAL Raid,” The Intercept, May 28, 2017, https://theintercept.com/2017/05/28/villagers-say-yemeni-child-was-shot-as-he-tried-to-flee-navy-seal-raid/. “Yemen: Al-Qaeda leader killed in Qabili ambush in Shabwah province, ”al Khaleej Online, March 14, 2017, http://alkhaleejonline.net/articles/1492174850241353700/%D8%A7%D9%84%D9%8A%D9%85%D9%86-%D9%85%D8%B5%D8%B1%D8%B9-%D9%82%D9%8A%D8%A7%D8%AF%D9%8A-%D9%85%D9%86-%D8%A7%D9%84%D9%82%D8%A7%D8%B9%D8%AF%D8%A9-%D9%81%D9%8A-%D9%83%D9%85%D9%8A%D9%86-%D9%82%D8%A8%D9%84%D9%8A-%D8%A8%D9%85%D8%AD%D8%A7%D9%81%D8%B8%D8%A9-%D8%B4%D8%A8%D9%88%D8%A9/; and “Tribal preparations to form an alliance against al Qaeda,” Aden Lang, March 11, http://adnlng.com/news/64187/. Iona Craig, “Death in al Ghayil,” The Intercept, March 9, 2017, https://theintercept.com/2017/03/09/women-and-children-in-yemeni-village-recall-horror-of-trumps-highly-successful-seal-raid/. “Several roads are closed with incense to demand the release of detainees,” April 13, 2017, http://adengad.net/news/254071/. “AQAP gives details on four-man suicide raid in Lahij governorate complex,” SITE, April 1, 2017, https://ent.siteintelgroup.com/Statements/aqap-gives-details-on-four-man-suicide-raid-in-lahij-govenorate-complex.html. 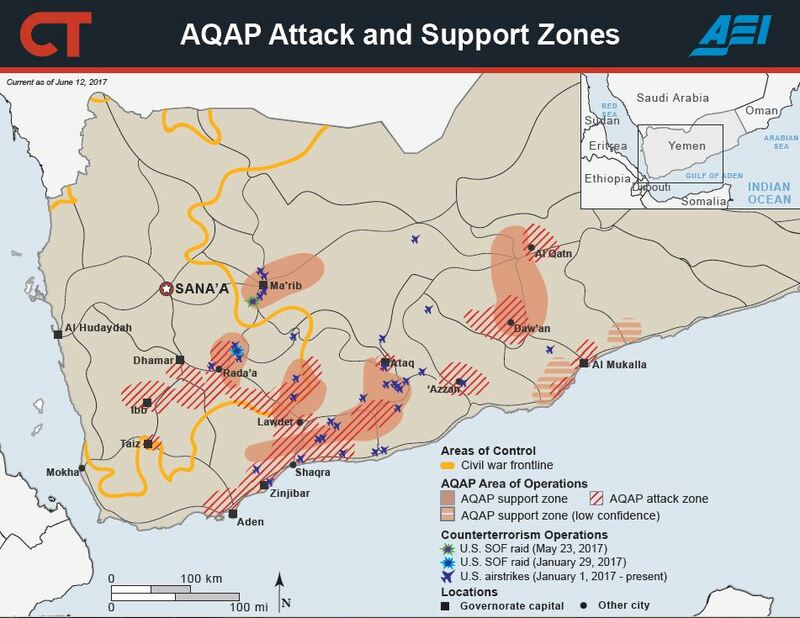 Katherine Zimmerman, “AQAP expanding behind Yemen’s Frontlines,” AEI’s Critical Threats Project, February 17, 2016, https://www.criticalthreats.org/analysis/aqap-expanding-behind-yemens-frontlines. Kathrine Zimmerman, “How the U.S. Should Re-Engage in Yemen,” AEI’s Critical Threats Project, February 24, 2017, https://www.criticalthreats.org/analysis/how-us-should-re-engage-in-yemen.